Calling All Questers! We are hiring for Summer 2018! We are seeking friendly, enthusiastic people with a passion for gaming at St. John’s premier escape room facility. Both full and part-time positions are available. Candidates must thrive in a fast paced environment, enjoy engaging large groups and demonstrate quick problem-solving skills. If this is totally you, then please see below for all the details, and we look forward to hearing from you! The position is full-time season and funded via the Canada Student Jobs Program for Post- Secondary Students.  Assisting with game planning and development. Please send your resume and cover letter to info@escapequest.ca, ATTN Kevin Noseworthy, Managing Operating Partner. Subject heading on the email should read Full Time Quest Guide Application. Application deadline is 5pm, Tuesday, June 12, 2018. Only applicants selected for an interview will be contacted. The position is Part-time with the possibility of renewal. 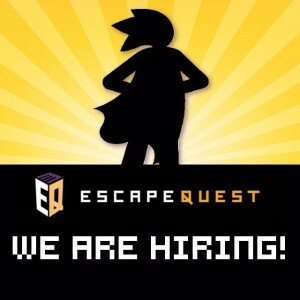 Please send your resume and cover letter to info@escapequest.ca, ATTN: Kevin Noseworthy, Managing Operating Partner. Subject heading on the email should read Part Time Quest Guide Application. Application deadline is 5pm, Tuesday, June 12, 2018. Only applicants selected for an interview will be contacted. Calling All Questers: We Are Hiring for Summer 2017! Local escape room business organizes a ‘Game it Forward’ day in support of displaced families of Fort Mcmurray. Calling All Questers: We Are Hiring!